BAKED ASIAN-STYLE SALMON WITH LOADED RICE (serves 4 or 6) | Crappy Kitchen - Good Dinners! This style dinner is the one dish that all of us in the house love equally, and if you make it, you’ll see why! Look how wonderful this salmon dish is and it takes less effort and time than you think! It is what I made for dinner last night because I needed to be efficient as time was not on my side. We had all sorts of commitments however I still wanted to squeeze in a good dinner for everyone, which would also give us a chance to sit together for a few moments before scattering. I think forgoing dinner to spend more time on the computer or doing your hair is a mistake. After all, I am the one who decided to have children and so I feel it is my responsibility to show them that you can still manage to cook an evening meal in the fast-paced techno world we have become. Avocado adds a creaminess to so many different kinds of dishes and is a great substitute for a dairy product such as sour cream or yoghurt. So, if you know ahead of time that you are going to be strapped for time in the evening, buy some salmon on your way home and make this dish. The salmon is baked so you don’t have to watch it on a pan and the rice dish can be made with whatever veggies you have in your fridge or pantry. There is always a way to figure something out and there is no recipe in the world that cannot be altered for taste and convenience, so no excuses! 1 – Cut salmon into 3 oz pieces and place in a shallow dish in a single layer. Mix the soy, mirin and sriracha (if using) together and pour over salmon. Mix it all together and turn over to coat the salmon completely. Leave in fridge until ready to bake. 3 – Preheat oven to 450* when you start sauteing the veggies. Rub some olive oil in the bottom of a baking sheet (I used a cookie sheet pan) and place the fish on the pan. Place in the oven for 6 to 7 minutes – no need to turn! Serve two pieces of fish with rice to each person or place fish on a platter and rice in a serving bowl and let everyone help themselves. 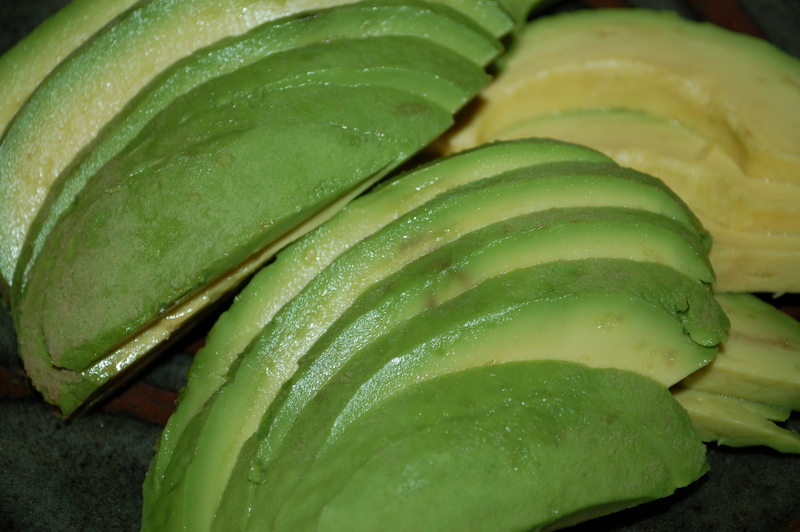 Serve avocado slices and drizzling sauce on the side. This would also make a great easy dinner party meal! This entry was posted in dinners and tagged asian dipping sauce, asian-style dinner, asian-style salmon, baked salmon, blood type A, Blood Type A diet, blood type A dinner, blood type A recipe, colorful rice, quick fish dinner, rice cooker, rice with vegetables, veggie rice. Bookmark the permalink.